This didn't really turn out as well as I'd hoped. 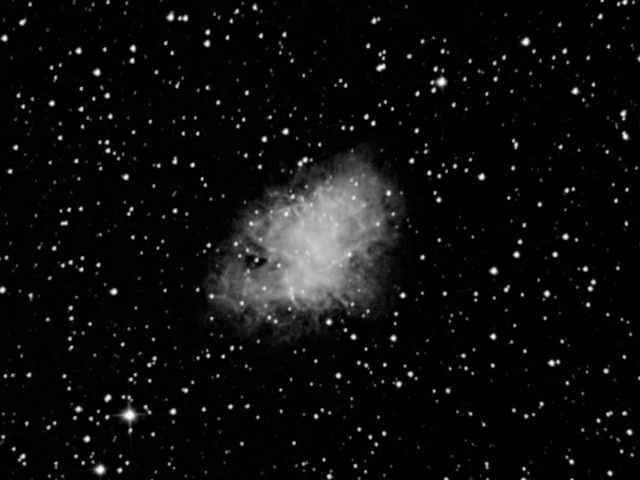 I think for a decent Crab Nebula you need to use colour as I did with the SC3 back in 2004. On its own it looks a bit grey. Mind you, I am quite pleased that this image goes as deep as it does, showing relatively noise free detail in the dimmer parts of the nebula. Although I do wonder if s imply binning it a bit would have resulted in a better image. Really need to concentrate on tightening up the remaining flexure in the guiding. Also, I fancy the focus wasn't quite as good as it should be. Something else to work on! Captured with 1x1 binning in ArtemisCapture. Calibrated and stacked in Maxim. Combination of DDP in maxim and curves and unsharp mask in photoshop used to produce final image.